Waymo is testing autonomous driving using Chrysler Pacifica minivans. DETROIT/MUNICH -- In the race to start the world's first driving business without human drivers, everyone is chasing Alphabet's Waymo. The Google sibling is ahead of traditional automakers such as General Motors, Mercedes-Benz and Audi by at least a year to introduce driverless cars to the wider public. 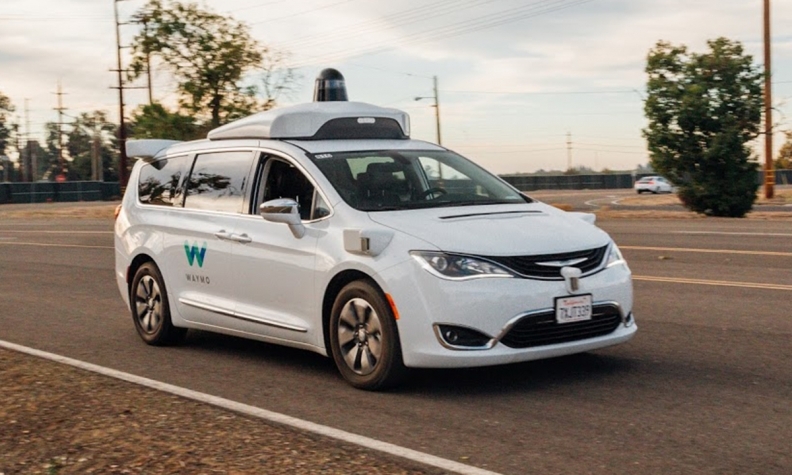 A deal reached in January to buy thousands of additional Chrysler Pacifica minivans, which get kitted out with sensors that can see hundreds of yards in any direction, puts Waymo's lead into perspective. No other company is offering for-hire rides yet, let alone preparing to carry passengers in more than one city this year. GM plans to start a ride-hailing service with a Chevrolet Bolt that has no steering wheel or pedals, the ultimate goal in self-driving technology, late next year. Most of the others trying to solve the last remaining autonomous puzzles are more cautious, targeting 2020 or later. The road to autonomy is long and exceedingly complicated. It can also be dangerous: Two high-profile efforts, from Uber and Tesla, were involved in recent crashes that caused the death of a pedestrian (in the first known case of a person killed by a self-driving vehicle) and a driver using an assistance program touted as a precursor to autonomy. One of Waymo's autonomous vans was involved in a collision just last week. But the perceived stakes are so enormous, with the promise of transport businesses needing little in labor costs, that many players are racing to master the technology and put it to work. The finish line isn't just reaching Level 4 on the five-step scale of autonomous driving. That's the threshold at which a car can drive on pre-mapped routes and handle anything on its planned course without the intervention of a driver. Only Waymo has tested Level 4 vehicles on passengers who aren't its employees and those people volunteered to be test subjects. No one has yet demonstrated at Level 5, where the car is so independent that there's no steering wheel. Goldman Sachs predicts that robo-taxis will help the ride-hailing and ride-sharing business grow from $5 billion in revenue today to $285 billion by 2030. There are grand hopes for this business. Without drivers, operating margins could be in the 20 percent range, more than twice what automakers generate right now. If that kind of growth and profit happen, it would be almost three times what GM makes in a year. And that doesn't begin to count the money to be made in delivery. For now, investors are throwing money at possible winners. Tesla's valuation soared in 2016 after an analyst from Morgan Stanley, also its lead underwriter, speculated that the company's EVs would spawn a self-driving fleet. GM shares are up 20 percent since a June 2017 announcement that a plant to build driverless vehicles was up and running. Zoox has already raised $360 million, a huge sum for a startup with no revenue. The most aggressive forecasts have the majority of people driving their own cars for at least the next decade. Chris Urmson, founder of Aurora Innovation and one of the pioneers of the field, counts as one of the optimists. "I can see these on the road in real numbers in five to 10 years," he said. That means even today's laggards have time to catch up. A pilot program of driverless vans will begin commercial service later this year, picking up paying passengers in Phoenix and branching out from there. Waymo CEO John Krafcik recently announced a deal to add 20,000 Jaguar I-Pace SUVs to the fleet and signaled that an in-the-works alliance with Honda could focus on delivery and logistics. Waymo also has by far the lowest rate of disengagement times, when an engineer needs to grab the wheel because the car makes a mistake, among all companies testing cars in California. The company also reported fewer accidents while testing in California last year: Waymo had three collisions over more than 350,000 miles (563,000 km), while GM had 22 over 132,000 miles. 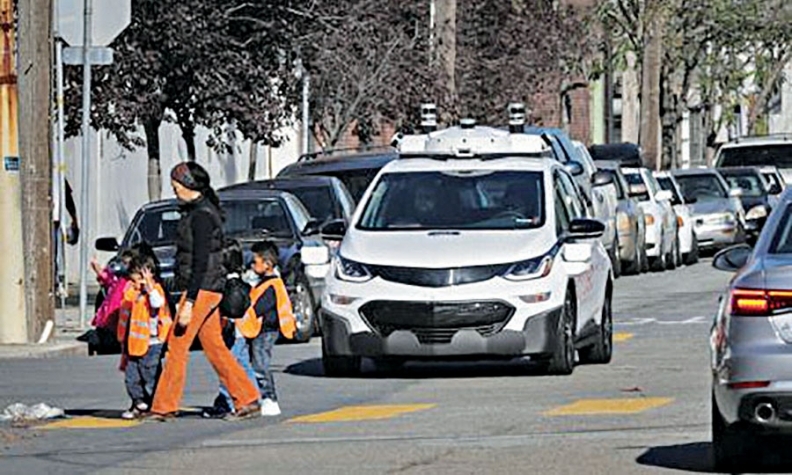 GM's Chevy Bolt can navigate the busy streets of San Francisco at speeds up to 25 mph (40 kph). The Detroit automaker is so confident that it plans to run a ride-hailing pilot next year in a car with no steering wheel or pedals, something only Waymo has done in road testing. After Waymo, a handful of major players have demonstrated similar driving capabilities. It's hard to say anyone has an edge. One advantage for GM: There's a factory north of Detroit that can produce self-driving Bolts. That will help GM get manufacturing right and lower costs without relying on partners. Right now, an autonomous version of the car costs around $200,000 to build, compared to a sticker price of $35,000 for an electric Bolt for human drivers. Where GM lags Waymo is speed. GM doesn't test faster than 25 mph, deeming that the safest top speed. Kyle Vogt, founder and chief executive of GM's Cruise Automation unit, said his program will soon be using new Lidar developed by Strobe, which the automaker acquired last year. Lidar sends out laser beams to map the road ahead and guide the car, and Strobe's version is smaller, cheaper and can see farther ahead than GM's existing equipment. That will enable faster driving. GM plans to spend $1 billion of its $8 billion annual capital expenditure budget to develop self-driving cars and mobility services. That money will allow GM the option of developing its own ride-hailing business. GM has not decided whether to run its ride-share pilot, slated for late 2019, on its own or to join forces with an established player. It's worth noting that the automaker already has a stake in Lyft. There's a big caveat with GM: It leads all companies that test in California when it comes to crashes. Last year, Cruise had 22 of the 27 accidents in the state involving driverless cars, and it experienced five of the seven incidents reported this year. The accidents have mostly been minor and not the fault of GM's car. In an interview, GM President Dan Ammann attributed the higher incident rate to the greater number of miles traveled in San Francisco's busy streets. 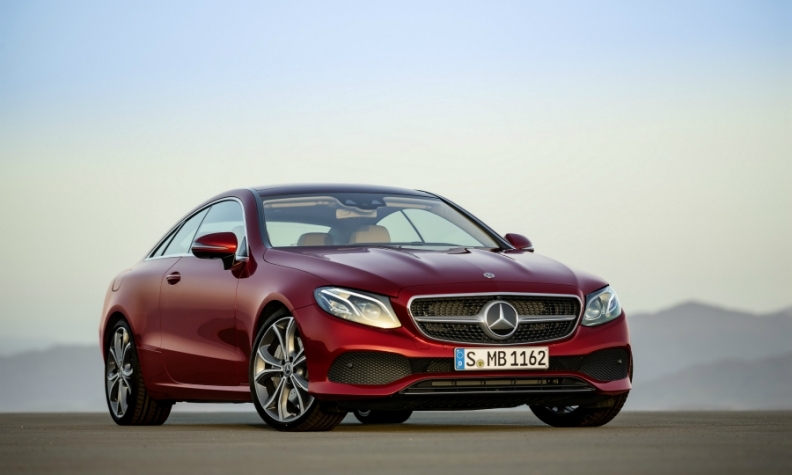 Mercedes' latest E-class models feature Intelligent Drive technology. Those systems help today's drivers. For the cars of tomorrow, Daimler works closely with Robert Bosch and will be using a system from Silicon Valley intelligent computing company Nvidia. The test cars can drive at Level 4 autonomy or even Level 5, which means the car doesn't need a steering wheel or pedals to operate. The company has been testing V-class vans around the roads of Boeblingen, near Stuttgart, where Mercedes-Benz has a research center. The automated vans run through purposefully challenging situations such as morning traffic. The technology is already at Level 5, Daimler's head of development, Ola Kaellenius, said in an interview, although a recent report by Bloomberg New Energy Finance put the target date for the company after 2020. Fully self-driving cars will be on the road at the same time, he said, but would be used for ride sharing services, because they would be too expensive for retail customers to buy. "The logical business case there is a mobility service, a robo-taxi type of thing," Kaellenius said. "You amortize the cost through the saving on the driver." The Symbioz concept showcases Renault's self-driving goals. No one would have imagined a decade ago that a vestige of bankrupt GM parts unit Delphi would be a player in the self-driving revolution. But Aptiv, an electronics unit that split from Delphi last year, has emerged as a player to be watched, said Grayson Brulte, co-founder of Brulte, a consulting firm that specializes in autonomous strategy. Aptiv has invested heavily in self-driving technology, buying software maker Ottomatika along with Lidar makers Innoviz, Leddertech and Quanergy Systems. Its biggest deal was buying NuTonomy, which has been running tests of driverless cars in Boston and Singapore at city speeds. The company also ran a robo-taxi demo in Las Vegas during CES. The company has been testing ride-hailing services in Singapore since 2016 and will have them operational in 2021, according to Navigant. Aptiv has been working with Audi and BMW to develop its technology. The same day in late November that GM showed off its self-driving Bolt in San Francisco, Zoox had its own car driving through the city's winding streets and heavy traffic. Zoox has about 250 engineers working to develop it. Its self-driving Toyota Highlander SUVs run on the same busy streets that GM uses to test the Bolt. But Zoox's car can also drive at highway speeds, said Bert Kaufman, head of regulatory affairs for Zoox. The challenge for Zoox is getting more funding to build its car. The company has raised more than $280 million but needs an additional $1 billion to finish its car, Kaufman said. Established automakers have their own vehicles, and Waymo has partnerships with manufacturers. That system was developed on the way to a full autonomous system, Ghosn said in an interview earlier this year. Right now, Nissan is testing a fully-autonomous car in Palo Alto, California. Renault recently showed off a long, sleek, copper-colored concept car called the Symbioz that can go 129kph (80mph) in full self-drive mode. The car still requires a driver to turn on autonomous mode, at which point the steering wheel retracts. With electric motors in front and back and measuring a lane-hogging 1829mm (six feet) in width and 4877mm (16 feet) in length, Symbioz isn't exactly the car that will go on sale. In March, Nissan tested an electric Leaf in a ride-hailing pilot in Yokohama, and Renault will do the same later this year in suburban Paris and Rouen with the electric Renault Zoe. While the alliance's technology is impressive, Ghosn sounds cautious. The French-Japanese conglomerate plans to test a self-driver on the road around 2020. That car will be on highways requiring only occasional driver intervention. By 2022, Renault-Nissan will have fully autonomous cars in the road, according to the Alliance 2022 plan. Audi, the luxury brand owned by Volkswagen Group, already has the most advanced autonomous car for sale in the A8. The car's Traffic Jam Pilot uses Lidar to see the road and lets drivers go completely hands-free at speeds up to 37 mph (60 kph). 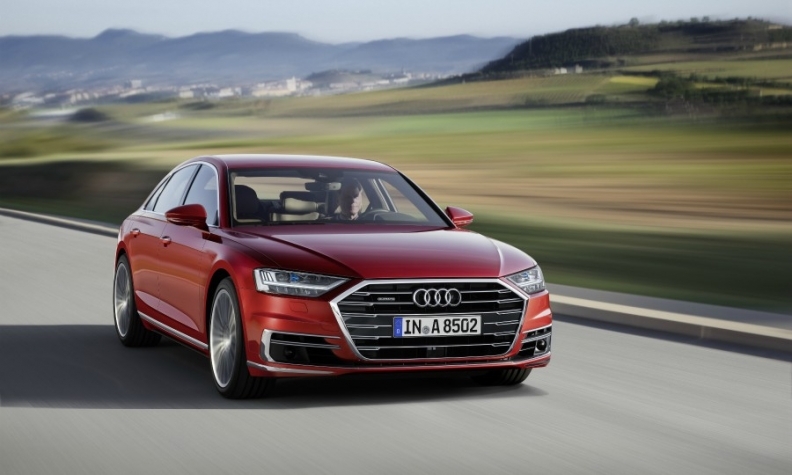 Audi's new A8 can drive itself at speeds up to 60 kph (37 mph) in a setting Audi calls Traffic Jam Pilot. BMW has a fleet of about 40 cars that can drive at Level 4 autonomy. The cars are driving around Munich and in California. The automaker doesn't see fully autonomous vehicles anytime soon. The company is testing completely self-driving cars that they have developed with partner Intel, which acquired sensor maker Mobileye, and with German supplier Continental. Fiat Chrysler Automobiles recently joined the partnership, which plans to have self-driving technology in production vehicles by 2021. No one can count Toyota Motor out. The company started developing self-parking technology in 1999 and installed it in the Prius in Japan in 2003, enabling the car to park with no input from the driver. Toyota kept quiet about its capabilities until CES in January, when the company showed off a boxy shuttle concept called e-Palette. 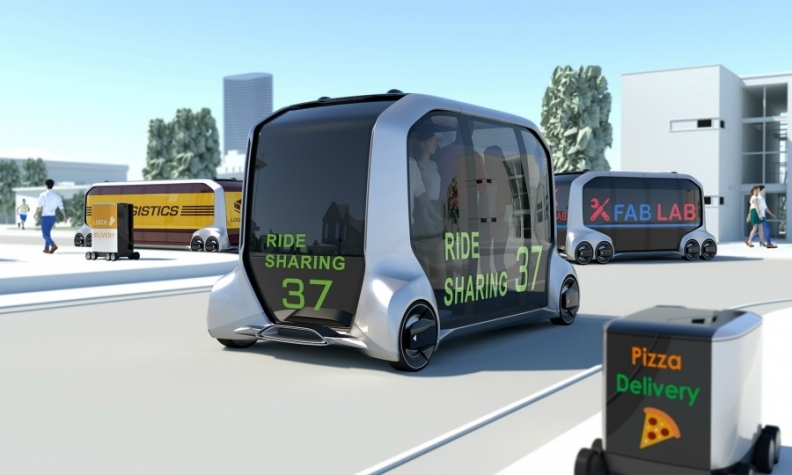 The Japanese automaker can make the self-driving shuttle in three sizes and it will debut publicly at the Tokyo Olympics in 2020 as a ride-hailing shuttle, said Gill Pratt, who runs Toyota Research Institute. Still, Toyota's message was one of patience. When Toyota tests its self-driving car in 2020, it may not have a driver or it may still have two people minding the front seats and the controls, Pratt said. He thinks a lot of automakers and tech companies are hyping the true state of self-driving vehicles. "We will get there," Pratt said, "but I can't tell you when." Ford has been considered a laggard, especially since former CEO Mark Fields was fired last year, in part for not having a cohesive vision for autonomy and future mobility. But it's not fair to say Ford is flat-footed. The company gets its technology from Argo AI, the artificial intelligence company in Pittsburgh that Ford paid $1 billion to take a significant stake last year. That investment brought in very good capabilities, said Sam Abuelsamid, an analyst with Navigant Research. The Argo team has a strong lineage. The startup is the brainchild of Bryan Salesky, who was director of hardware development of what is now Waymo, and Peter Rander, who was engineering lead at the Uber Advanced Technologies Group. Salesky's experience dates back to the beginning of self-driving cars: He was senior software engineer on the winning team in the 2007 autonomous vehicle challenge funded by the Defense Advanced Research Projects Agency (Darpa). Toyota's e-Palette Concept Vehicle gives a glimpse of the automaker's future mobility plans. Volvo has a goal of eliminating all injuries to passengers in its cars by 2020. That looks unlikely, but the company has 500 people developing its own self-driving technology. Right now, its Pilot Assist gives a driver 15 seconds with hands off the wheel, keeping the car in lane and managing the distance to a vehicle ahead. The automaker, owned by China's Zhejiang Geely Holding Group, is developing more autonomous technology but won't be ready to go to market until 2021, according to a report from Navigant. Volvo is also working with Uber to develop autonomous systems for the XC90 SUVs. If you're coming from behind, might as well find a partner to usher things along. Korea's Hyundai Motors will have an advanced safety system on the road this month that allows drivers to take their hands off the wheel for 15 seconds. Most traditional automakers rushed to get a self-driving vehicle program once Waymo and Uber started working on it. Automakers feared that low-priced self-driving taxi services would replace car ownership and that they would just supply the hardware, just as Foxconn Technology makes the phone for Apple and Apple makes the real money selling content and services. Ride-hailing giant Uber placed two huge bets on autonomous vehicles, first hiring top employees from Carnegie Robotics in 2015 and then acquiring the self-driving trucking startup Otto in 2016. But the program has been mired in controversy after a high-profile lawsuit and a then fatal collision. Throughout 2015, Uber recruited top robotics talent from Carnegie Mellon as it built its Advanced Technologies Group in Pittsburgh, Pennsylvania. That group, led today by former Carnegie Robotics co-founder Eric Meyhofer, has spearheaded Uber's self-driving car program. In an effort to catapult Uber to the front of the autonomous-vehicle arms race, Uber acquired Otto Trucking in August 2016, buying a team filled with former employees of Alphabet's self-driving car unit. Then in March, bad turned to tragic when a self-driving Uber struck and killed a pedestrian in Tempe, Arizona. Uber quickly suspended all of its public autonomous-vehicle testing as it awaits the results of that investigation. If Tesla CEO Elon Musk can get the world's most powerful rocket off the ground with his company SpaceX, maybe he can also get cars to drive themselves. Tesla's Model S and X both have Autopilot, which can pass other cars and change lanes with no hands on the wheel. While it's not a fully autonomous system, it has given Tesla a lot of data about how its cars perform when driver-assistance software is engaged. Tesla has been under fire lately, after another person died in an accident while using Autopilot. Where things get murky is that Musk eschews the Lidar systems that most automakers and tech companies are using. He says he wants to develop more advanced imaging to give his cars a much better pair of eyes. Analysts from BNEF project that Tesla will be able to field Level 4 cars in 2020, although that timetable could be subject to change now that the company entered into a public spat with federal safety investigators over the fatal crash involving Autopilot. The Chinese government in March gave Baidu permission to test cars on 33 public roads in the suburbs of Beijing, making it first on the roads in China. The company's goal is to test the system in buses made by Chinese manufacturer King Long later this year and, by 2020, to have autonomous vehicles capable of Level 3, meaning the car controls itself at highway speeds and tells the driver to take over in complex situations. Baidu's initial self-driving cars will be developed with China's Chery.